Aston Martin is revealing the first photographs of its production V12 Zagato, following the debut success of the concept model. Inspired by the Aston Martin DB4GT Zagato, one of the most desirable and valuable cars ever made, the V12 Zagato is a modern day masterpiece. Justly proud of the sophisticated craftsmanship and technology of the new V12 Zagato, Aston Martin are giving us a behind-the-scenes tour on what goes into making a contemporary classic. From the very first moments of the design process, Aston Martin knew that while they wanted to draw inspiration from the V12 Zagato’s illustrious forerunner, the new car would have a definite personality of its own. To that end, Aston Martin determined to combine the very best of modern engineering, design concepts and luxe materials, with their tradition of outstanding craftsmanship. After receiving the initial design ideas in early 2010, Aston Martin’s top design team found themselves with the enviable challenge of creating the V12 Zagato’s shape. To do this they needed to maintain a delicate tension between creating new boundaries for Aston Martin’s design language and paying homage to its inspiration. The Aston Martin team worked quickly to produce a pair of show-stopping concept cars by spring 2011. In May of that year, Aston Martin revealed their concept to the world at the prestigious Villa d’Este Concours. The car went on to take the first place in the Concept Cars and Prototypes class, while the rapturous reception from attendees confirmed that there would be demand to purchase, lease or finance a production model. 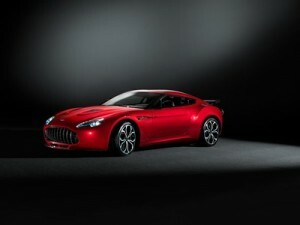 And so the V12 Zagato went into a limited production run. Built at Aston Martin headquarters in Gaydon, Warwickshire, it takes 2,000 hours of work to complete each model. The car’s body is hand-crafted from aluminium and carbon fibre, and then painted in a dedicated area. The V12 Zagato is available to purchase, lease or finance in a choice of four colours mixed solely for it: Scintilla Silver, Alloro Green, Alba Blue and Diavolo Red. After the 100 hour painting process, Aston Martin engineers connect the body to the powertrain, after which it goes to the laboratory-like finishing area. Here time and attention is amply lavished on the V12, including fitting the signature curved rear window, leading into the sculptural ‘double bubble’ roof. Then the hand-crafted interior is fitted, complete with what Aston Martin describe as jewel-like detailing. This includes hand-stitched leather upholstery and a satin-finished carbon fibre dashboard. Designed for the most discerning car collectors in the world, the Aston Martin V12 Zagato is available to purchase, lease or finance from £330,000, excluding VAT. If you’re looking to purchase or lease a new Aston Martin contact our sales team. Alternatively, visit our website where you will find new and used Aston Martin’s available for sale or on finance.